Say it's a sultry summer night and a tomato sounds like the start of a tasty supper. A gastronome might take that tomato, quarter it, drizzle it with fragrant olive oil and piquant balsamic vinegar, and serve it studded with fresh mozzarella and peppery basil. A molecular gastronome, on the other hand, might take the same tomato, boil it together with the algae extract agar-agar, stuff it inside a silicone tube, ice it, and squeeze out a spaghetti-like ribbon of tomato gel. You say tomato . . . a chef like Doug Lang says reconstructed tomato soup. Lang, head chef of the UO's central kitchen, speaks the specialized language of molecular gastronomy. 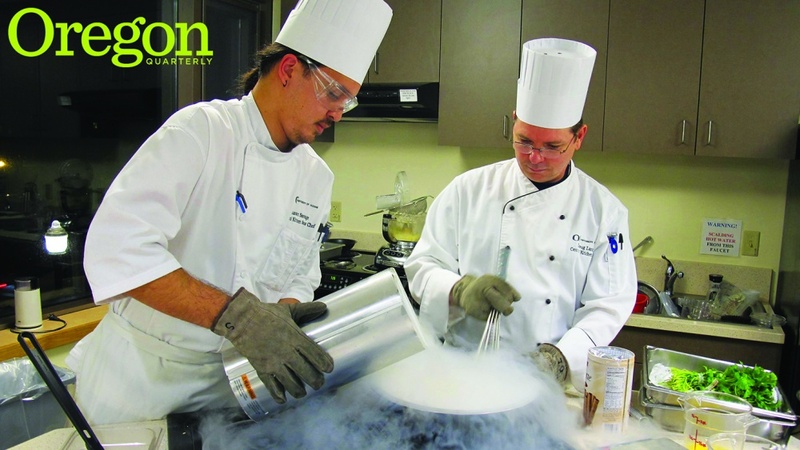 He has teamed up with Randy Sullivan, a lecture demonstrator in the chemistry department, to spread the good word of chemistry through the scientific side of cooking. Coined at an experimental cooking workshop in Sicily in 1992, the term "molecular gastronomy" refers to the process of taking ordinary ingredients, such as carrots and beets, and shape-shifting them with a chemist's potions, supplies, and techniques, changing their molecular structure. In the kitchens of high-end restaurants that feature such cuisine on their menus, dehydrators, immersion circulators, and centrifuges share counter space with more traditional cookware, like roasting and soufflé pans. Sodium alginate, Ultra-Tex 3, and hydrocolloids such as agar-agar and maltodextrin share pantry shelves with flour and sugar. And bubbling in the corner? That's a cauldron of –195°C liquid nitrogen, for flash freezing. Molecular gastronomy informs the cuisine at some of the world's finest restaurants. Perhaps you've noticed chefs fizzing up plates with all manner of flavored foams. Well, you can thank Spain's Ferran Adria, the "father of foam," for that. As chef of the now-shuttered El Bulli, Adria came up with the idea of mixing highly flavored liquids, such as tomato water, with gelatin and shooting them through a whipped-cream charger. Stateside, Chicago's Grant Achatz has put his own mark on avant-garde cuisine at Alinea, named one of the 50 best restaurants in the world by Restaurant magazine. 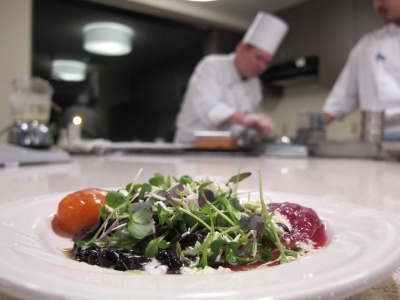 UO chef Lang has the Alinea cookbook flipped open on the counter of the demonstration kitchen at the recently opened Global Scholars Hall one evening, part of the set for a Lang-Sullivan molecular gastronomy demo. Sullivan's demos are a hit with students because they bring abstract scientific processes dramatically to life. In a previous demonstration, for example, he created an "ethanol cannon," using the spark from a Tesla coil to ignite ethanol in a bottle and shoot out the cork. To demonstrate the power of atmospheric pressure, he poured a bucket of water into a 55-gallon steel drum and boiled it until the drum filled with steam, then sealed the drum and doused it with cold water, causing the steam inside to condense. The audience gasped as the steel drum collapsed like a flimsy soda can. "Science is fascinating," says Sullivan. "There's color, there's sound, there's smell. It's a sensory extravaganza. But we're usually talking about it in a classroom, which is kind of like talking about swimming." For this evening's demonstration in the residence hall, Sullivan, Lang, and sous chef Shawn Savage, also of the university's central kitchen, have planned a three-act menu. Dinner begins with a plate of salad greens dotted with caviar-like spheres of carrot and beet juice. To create these spheres, Lang adds calcium lactate and agar-agar to the juices, then pipes drops of the liquid into a sodium alginate bath—"reverse spherification," Sullivan explains. The result is a gel capsule that pops in the mouth, releasing the vegetable juice. The finished salad is dressed with spheres of balsamic vinegar and a sprinkling of olive oil given the texture of wet sand with the addition of tapioca maltodextrin. It tastes like a carrot and beet salad, but the texture is entirely unexpected. Savage takes over during the second course, making a straightforward scallop ceviche (see recipe) while Sullivan describes the chemical process that allows lime and orange juices to denature the scallops' long chains of molecules, "cooking" the seafood without heat. Savage then whizzes together a mixture of avocado, milk, and agar-agar. He pumps the mixture through a nitrous oxide-fueled whipped-cream canister, creating an avocado foam that makes guacamole look like a country cousin. Then, he uses liquid nitrogen (LN2) to freeze slices of Roma tomato, orange, and lime, which he grinds to a fine, pastel palette of garnishes for a "scallop ceviche with avocado espuma and LN2 dust" that would make the father of foam proud. For dessert? The menu promises "cryogenic custard." The chefs dunk chocolate Pirouette cookies in brandy, and Sullivan obligingly flambés them with a blowtorch. 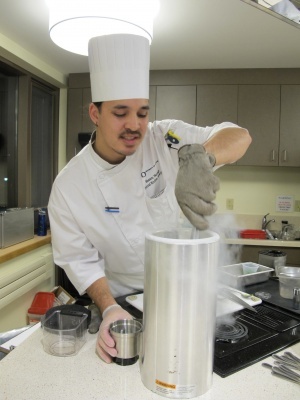 Lang uses liquid nitrogen to flash-freeze a vanilla custard base, and the resulting ice cream has a silken-smooth texture from setting up so fast. Lang and Sullivan put on the first of these science shows in 2011, their presentation one of several Community Conversations, a series of events brainstormed and organized by students and held in the UO's many residence halls. Sullivan is a faculty fellow with the program, which is intended to bring intellectual experiences directly into student housing. This evening's demonstration is a far cry from Lang's usual duties overseeing 35 cooks as they slice, dice, and steam $3 million worth of groceries every year for the university's dining halls. His kitchen produces 80 gallons of ranch dressing and 90 gallons of teriyaki sauce each week, contributing to the 15,000 meals served daily on campus during the academic year. "I have a lot more experience with egg cookery than reverse spherification," Lang says. Doug Lang, Shawn Savage, and more than two dozen others chop, simmer, and sauté 15,000 meals per day, all from a cramped, 1949 kitchen in the basement of Carson Hall. Their work space is about to get a lot more comfortable—and efficient—with the construction of a new building that will bring UO kitchen and catering operations together and add about 4,800 square feet of cold storage and 1,500 square feet of dry storage space. The $8.5 million project, which includes a woodshop that will consolidate repair and maintenance operations currently scattered across campus, will be built on a site near Matthew Knight Arena currently occupied by a dozen 1940s-era cottages built as temporary student housing during the UO's postwar enrollment boom. While the new kitchen probably won't include liquid nitrogen caldrons or nitrous-oxide espuma canisters, it will allow the university to increase its purchasing of local produce and introduce efficiencies expected to save about $500,000 per year. And that's an appetizing thought indeed. Shawn Savage, sous chef in the UO's central kitchen, offers this basic recipe as a simple and succulent introduction for DIY molecular gastronomes. The ceviche is delicious on its own, but if you're feeling adventuresome, recipes for the dish's other components—avocado espuma and LN2 dust—may be found at OregonQuarterly.com. Mix all ingredients together and marinate in the refrigerator for four to six hours. Garnish with chopped cilantro. Serve chilled. Serves four to six.